“The original plan was to end the Mythic Legions: Siege at Bjorngar pre-order today (Dec. 27th), and while the pre-order is going fantastic and has already far exceeded our expectations (thanks to all of you who’ve pre-ordered and helped spread the word for that), there’s been an overwhelming request from Mythic Legionsfans and customers to extend the pre-order for at least a few more days since this pre-order dropped so close to Christmas, and we understand that. 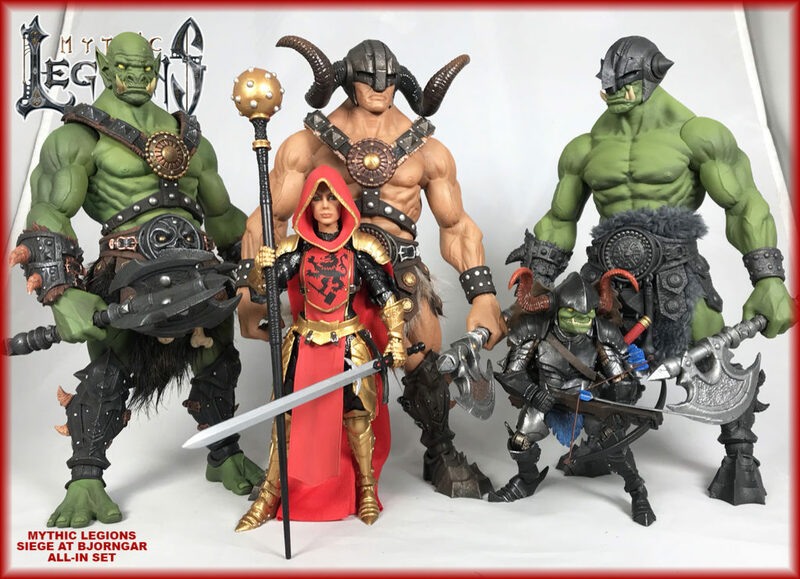 So, as a New Yeargift to all of the loyal and rabid Mythic Legionsfans, the pre-order for Mythic Legions: Siege at Bjorngaris being extended by about a week and a half, and it will now close out on Jan. 7th, 2019 at 9pm EST. Go to: www.storehorsemen.com to order. Evil’s return to Mythoss was calculated, deliberate and entirely lacking in fanfare or bombast. Its subtle dark malice crept over the realm like a shadow, cursing it slowly. Ages of peaceful complacency led many to turn a blind eye toward the evil forces that lurked in the dark. The first major show of force ushering in the new age occurred when the Legion of Arethyr spilled out from their realm of Arethorn and into the rugged wastelands of Bjorngar. Considered the first major battle in the second age of darkness, the siege at Bjorngar serves as a bloodstained landmark in the history of Mythoss. The Goblins of Gobhollow usually stay deep in the caves and caverns that make up their kingdom. However, when necessary, they will sometimes send parties out from the depths of the mountain and into the light. These small groups scout for oncoming danger, hunt for sustenance and generally wreak havoc and mayhem wherever they go. Thwikk, an expert marksman known for his deadly crossbow and menacing grin, leads the band of bowmen who protect the perimeter entrances to Gobhollow. With his sinister wit and his penchant for causing pain, Thwikk is counted on to provide a key line of defense for his brethren who dwell behind the mountain walls of Gobhollow. Although the Army of Leodysseus is considered the military arm of the Legions of Light, they appreciate the importance of the clerics and mages within their ranks. Faustia is the Army’s Chief Cleric and a close advisor to Attila Leossyr. While most clerics try to find balance between magic and sword, Faustia’s unusually fierce demeanor befits the Army of Leodysseus. Faustia’s unique style of combative magic makes her a deadly and trusted ally to Attila and his cause. With a name that strikes dread and fear throughout Mythoss, Kkurzog stands out for his vicious brutality even in a legion famous for its brutal nature. Gargantuan ancestors of Orcs and Goblins, Ogres are savage powerhouses that bolster the ranks of the warriors of Arethyr. Standing at nearly nine feet tall and weighing three times as much as their Orc cousins, Ogres do much of the heavy lifting for their legion. Responsible for transporting and operating battering rams, catapults and other large scale armaments, the burden of their responsibly is exceeded only by their sheer savagery. Capable of speaking both Orkish and some of the more civilized tongues, Kkurzog acts as both an interpreter and general to the Orc warriors. As the link between his kin and the Legion’s leadership, not only is Kkurzog an essential leader, he is also a cruel master capable of wielding his own people as a weapon of war. Giants and their offspring are a maligned and misunderstood people, especially those that hail from the harsh and unforgiving wastelands of Bjorngar. While many mistakenly think of them as indistinguishable from the unseemly creatures that make up the ilk of the dark armies, in truth, these imposing folk are quite similar to their smaller human cousins. A Half-Giant, Bolthor the Tower was the first of his kind to align with Attlus the Conqueror and his House of the Noble Bear. Unexpectedly, Bolthor is as warm and jovial as he is devastating with his axe. After proving himself at the Siege at Bjorngard, Bolthor is both a core member of Attlus’ inner circle and a legendary hero. 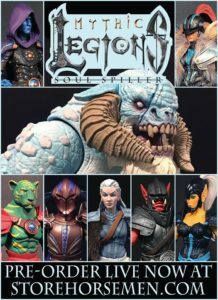 As many of you may already know, the pre-order currently happening on StoreHorsemen.com – Mythic Legions: Soul Spiller – is scheduled to end tomorrow (Wednesday) afternoon, and the response to this wave has been overwhelmingly positive, so we want to thank all of you Mythic Legions fans for that. As has happened in the past, we’ve had MANY requests from Mythic Legions fans to extend the pre-order until Friday, Saturday or even Monday, and we’ve decided to honor those requests since a few extra days extension on our end isn’t going to delay the production schedule by any significant amount. In the future we’ll probably plan to have all of our pre-orders end on Monday for just this reason.